Ports of Auckland Ltd plans to look at the long-known hydrogen energy technology to build Auckland’s first hydrogen production and refuelling facility. 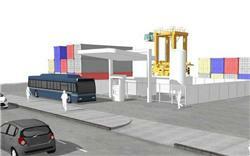 The ports authority said its principal the Auckland Council, KiwiRail & Auckland Transport would support the project. The blueprint is for a hydrogen production and refuelling facility at its Waitematā port and the partrners would support an investment in hydrogen fuel cell vehicles including port equipment, buses and cars. To meet that target there would be “a renewable and resilient power source for heavy equipment like tugs and straddle carriers. The process uses electrolysis to split water into hydrogen (which is then stored for later use) and oxygen, which is released into the air. Demonstration vehicles could fill up with hydrogen at the facility, which will be just like filling up a car with CNG or LPG. Hydrogen is used in the fuel cell to create electricity which powers the car. The only by-product is water. Trucks, trains and ferries could also run on hydrogen, as has been illustrated overseas. KiwiRail acting CEO Todd Moyle said that while rail is an inherently sustainable form of transport with 66% fewer carbon emissions than heavy road freight, new fuel sources like hydrogen has enormous potential for NZ. “Just weeks ago, two hydrogen-powered trains with a range of 1,000 kilometres per tank began operating commercial services in Germany. If successful with passengers, there is no reason why the next development could not be hydrogen-powered freight trains,” he said. Hydrogen energy has been extensive trialled and hydrogen vehicles are in use in the UK, US, Japan, Korea and Europe. Radio New Zealand said Ports of Auckland plans to apply for resource consent early next year and hopes to have it completed by the end of 2019. The proposed facility will be designed by hydrogen fuel expert Arup. An artist’s impression of what an hydrogen energy plan may look like. Source: Ports of Auckland Ltd and utilised by Radio NZ.